This 1-5x24 Military Riflescope from Steiner features broadband transmission optics, a weather-sealed housing and illuminated Rapid Dot ballistic reticle calibrated for NATO 5.56 (.223) caliber rounds. Steiner's anti-reflective broadband multicoating allows the lens system to transmit crisp images that are rich with contrast and brightness. A constant 3.5" eye relief and fast focus eyepiece provide a consistent viewing experience and ability to dial-in the etched glass reticle to suit the shooter's vision. 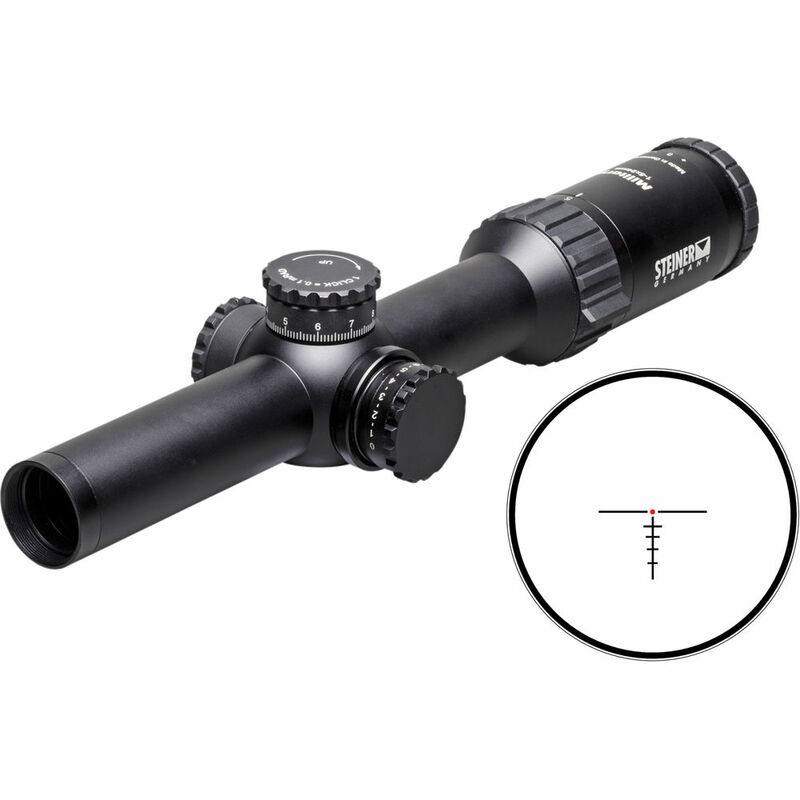 A one-piece machined aluminum housing with sealed turrets and nitrogen-filling equip Steiner's Military series riflescopes for weather-resistant performance in extreme temperatures, rain, and humidity. Uncapped target-style turrets with 0.1 mrad impact point corrections enable precise shot placement. An 11-level reticle brightness adjustment system with intermediate standby settings gives the shooter several illumination options for daylight and low-light conditions. The 1-5x zoom range and full complement of handling features make this Military series scope well-suited for close-range targeting with NATO 5.56 (.223) rounds. Box Dimensions (LxWxH) 19.3 x 4.6 x 4.1"